The recent and devastating wildfires in California have once again illustrated the importance of being ready and having a plan in place. Despite being a regular occurrence, 2018’s wildfires were the worst on record, and you never know when it’s going to be your turn. In the wake of the fire, numerous communities had to be evacuated, failing which the casualties would have been much higher. With this horrible event in mind, we thought it a good time to help you formulate an evacuation plan for your mobile home park. Hopefully, you’ll never experience something as devastating, but if you do, at least you and your residents will know you’re facing it well-prepared. You’ll know exactly what the threats are to your park. Know which residents are vulnerable. Identify what help is available to your residents in the area and how to access it. Ensure organization during an evacuation. People are less likely to panic if there is a step-by-step procedure. It helps to keep you in contact with the right people. Help get your residents involved by giving them responsibility during an emergency/evacuation. Once you have a plan in place it can easily be updated. And, most importantly, a clear plan helps avoid slip-ups and saves lives! If you don’t have a community emergency coordinator, then appoint one. Appoint other members/volunteers and assign responsibilities. None-English-speaking or those with communication difficulties? Acting as part of the emergency group? Make sure to field other concerns or issues from your community members. It might help shine a light on anything you haven’t thought of yet. This may not strictly be a part of your actual document but it’s an important thing to have. If you have different versions of this document (as we’ll mention later) then you can come up with separate distribution lists. These lists can then be delivered to the right people. For example, you could have a distribution list to make sure every resident of the park gets a copy of the evacuation plan. You should also have separate lists for your emergency coordination group, your local emergency services, and local authorities. You should start off your evacuation plan with a section that details the potential threats or disasters in your area. Some of these will be self-evident or well-known because they regularly occur. For example, it’s well-known that California is particularly vulnerable to wildfires during the dry time of year. On the other hand, hurricanes frequently occur in the South and Western U.S. between June and November. Once you’ve identified these threats, come up with a table that details what the effects of the threats could be. Add to the table how you can prepare for those effects. For example, list ways in which fires can impact your park and evacuation procedures. Then discuss how it can be stopped or retarded from reaching your park. This section is where you list potential resources that you can source from your community in case of an emergency. This list can include people or businesses both within and without your mobile home park as long as they are near enough to respond. have different kind of equipment or training to deal with certain disasters. It could even include a nearby shop or garage where you can buy gas, supplies, or food in an emergency. Get their contact details and address and make sure they know that they are listed. Here, you need to list the details of any local disaster centers where you and your park residents can evacuate to. You should contact your local authorities and emergency services if you don’t know where the local disaster centers are. These are usually schools, stadiums, or churches earmarked as meeting points or rest centers during evacuations. If there are no designated centers in your area, you can organize it yourself with the help of one of these local organizations. Just make sure they are in a safe place and have adequate facilities. Next up is your emergency contact list. 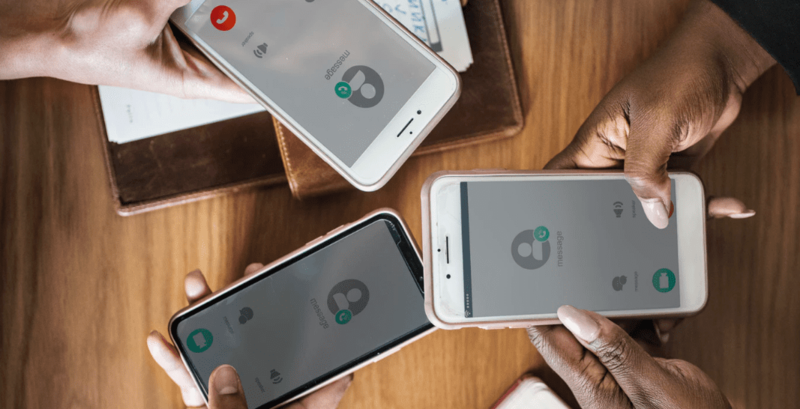 This should be a table or list that includes the name, contact details, title, and purpose of every person or emergency service that you’ll need to contact in an emergency. Usually, your community’s emergency coordination officer will be at the top of the list. This list can include the fire department, local police, any aid organizations, etc. A useful addition to your community evacuation plan is to include a telephone tree along with your emergency contact list. This tree effectively creates a chain of who contacts who. This will help remove any confusion caused by multiple people trying to contact each other. It will also help the spread of consistent information so that different information and commands don’t come from separate sources. This tree will usually start with the community emergency coordinator who will have two or three people they need to contact. Each of these will then have another two or three to contact, and so on. This list builds somewhat on your emergency contact list but includes other organizations that may be needed in the aftermath of an emergency. This could include any local organizations that can provide specialist care or services, especially to vulnerable people in your community or people with special needs. For example, elder care services would be on this list. 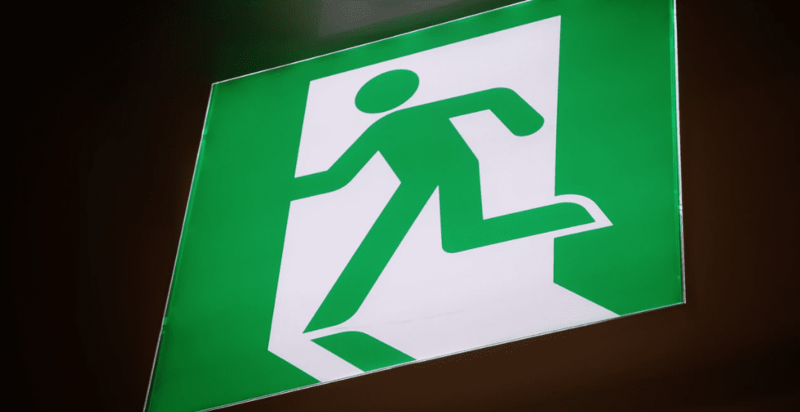 This section details what needs to happen and who is responsible for kicking off the emergency procedures that you detail in the following section. For example, you can activate your plan following a warning from emergency services, over a local fire radio, etc. However, it also needs to detail how evacuation procedures are triggered if emergency services don’t make contact or aren’t available. Usually, the community emergency coordinator will be responsible. However, you need to make a provision if they aren’t around and the community needs to activate it themselves. This is the most important section of your evacuation plan. Here, you will lay out the steps to follow for your community members according to the evacuation procedures. If you can, it’s important to formulate these steps with the help of the local emergency services or experts. The USA.gov’s Disasters and Emergencies section is a fantastic resource. If you have good relationships with the local emergency services, you may also want to send them a copy so that they know what to do when responding to your park. As part of this, come up with an evacuation plan for your community. This usually means identifying meeting spots or evacuation routes throughout the park. You can also come up with separate lists, one for residents to follow and another for your emergency group to follow and tick off as each task is completed. Evacuate your home and make sure that everyone in your household is accounted for. Make your way to the designated meeting/evacuation spots in the community. Make sure someone in your group contacts an emergency group member or that one is present. In the absence of an emergency group member or if you are unable to contact one, make your way to the nearest local disaster center. You could also have separate lists or steps for different types of emergencies. Make sure that they are tailored to your park residents and particular threats. This section describes how you and local authorities will cooperate in case of an emergency. For this part, it’s absolutely essential to actually meet with your local emergency services and authorities to find out how they can help you or what you need to do on your own. To do this, you’ll need to provide them with your own procedures and the needs of your residents. For example, they should provide you with a timeframe in which they can reach your community and help you with evacuations. In the event that they aren’t in time, you need to tell them what your procedures are and where you will be taking your residents. It might not always be possible for your community to communicate with each other or with emergency services during a disaster. For example, the phone lines or cell phone towers could be destroyed by a hurricane or wildfire. In this case, you’ll need to have emergency communication devices in places such as walkie-talkies that are distributed among your emergency group and residents. You should also have one or two long-range walkie-talkies or satellite phones with which you can contact the authorities outside your community. As part of your emergency evacuation document, you should also come up with an agenda of what to discuss at your regular emergency group meetings. Following an agenda with the right questions and discussion points will help you keep your document up to date and relevant. 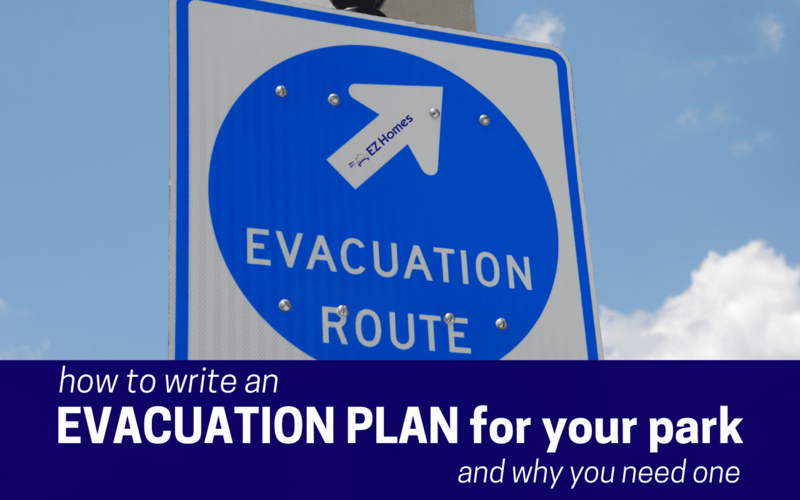 It’s important to treat your evacuation plan as a living document. Even though certain disasters or emergencies are well known and understood in certain areas with clear patterns, doesn’t mean unexpected events couldn’t occur. For example, drier years than normal could mean higher chances of wildfires. Similarly, new community organizations and aid groups can be formed or emergency centers opened. You may need to delete or make new emergency contacts. And be sure to update the plan as old residents move out or new ones move in. It’s also important that your residents don’t only know what to do in an emergency on the micro level within the park, but on a micro level within their homes as well. The HUD Code provides strict guidelines for safety within mobile homes as well as evacuation procedures from them. 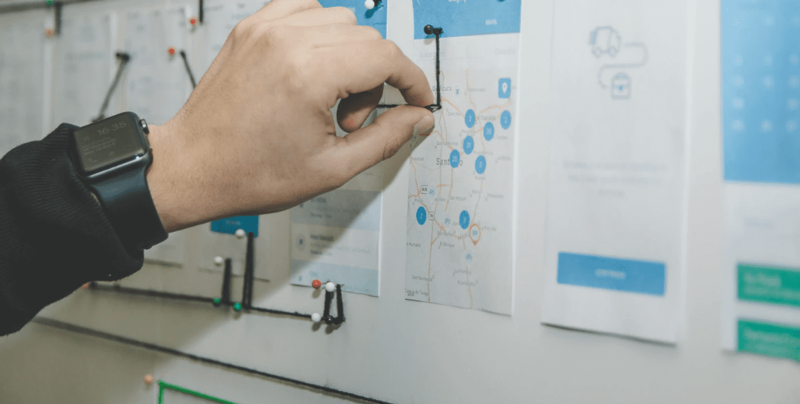 In order to truly be safe, and to make your emergency procedures more effective, you’ll need to ensure that the homes themselves are up to code. For example, the HUD code dictates safety standards and procedures related to fire alarms, fire retardant materials, egress doors of a mobile home, etc. That a home should have two unobstructed egress doors is the most important from a park evacuation perspective. Keep your community safe with an evacuation plan! Although an evacuation plan can’t guarantee the safety of everyone in your park, it’s a huge step in the right direction. A clear, detailed document helps everyone involved – from residents to management to the local emergency services. Knowing what to expect and then being able to coordinate with each other is simply the best way to avoid the worst possible outcome. We’ve provided some additional info on being prepared for emergencies in your mobile home park. A good start after reading this is to identify possible threats or disasters in your area and to give yourself a deadline to have a plan in place.